A part of the PKL franchise since 2014, the Bengaluru Bulls Team is owned by WL League Pvt. Ltd. The team has frequently struggled to finish in a strong position and many loopholes in their strategies saw them finishing on the lower end of the leaderboard. Things were not always like this with the team as they have finished fourth in their debut season and were the runner-up team of PKL season two. 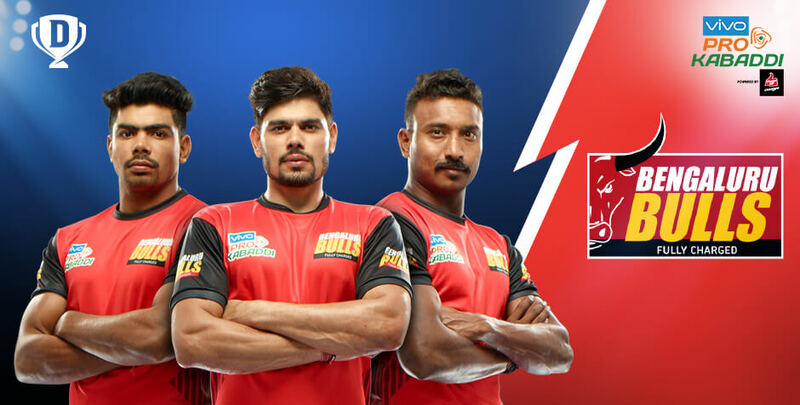 The Pro Kabaddi seasons for Bengaluru Bulls have been dismal in the last three seasons and the team is desperately looking to return back to the pinnacle of their form and take a shot at the title. Many changes in the Bengaluru Bulls team 2018 are sure to rekindle that vigour and shake off the memories of the past couple of years. Bengaluru Bulls owners went into the PKL auctions with a well thought out plan and came out with a selection of big names and promising young talents. The team spent big bucks to retain Rohit Kumar and acquire raiders Kashiling Adake, Pawan Kumar Sehrawat and defender Mahendra Singh. Bengaluru Bulls captain Rohit Kumar is a well-known figure in the PKL. As the most valuable player of season three, the second highest scorer in season five and a comfortable rank four on the list of players with most Super 10s in the league, Rohit is the player to watch for this season. Rohit Kumar started his PKL career in season three with Patna Pirates and almost instantly made a big impact, his agility is lauded and his calm demeanour and leadership ability make him the apt choice to lead the Bengaluru Bulls kabaddi team for season six. Kashiling Adake is an absolute menace in raiding and a nightmare for opponents. His spectacular flexibility allows him to escape out of reach from the best of PKL defenders. Kashiling has led his team’s raid points tally in every season of the PKL and finished as the top raider of season two. With Telugu Titans, the Tamil Thalaivas and the Bengaluru Bulls being a part of Zone B, the duels between the southern teams will most certainly spice up the contest. Team Bengaluru have built up their defence like a fort, retaining Mahender Singh and Ashish Kumar was a wise move and is sure to benefit. Mahender Singh A.K.A Bulldozer is among the best in the business for left cover defence. His signature Dash move is known to come down heavy on the most seasoned of raiders. Singh also finished season five as the most successful left cover defender. Bengaluru Bulls players list also includes international athletes Dong Ju Hong and Gyung Tae Kim, both Korean nationals. Known for introducing new players to the league, Bengaluru Bulls coach Randhir Singh continues to back the team. One of his major finds in the league has been Pardeep Narwal. You have enjoyed hours of fun with cricket on Dream11. Here is your chance to participate in the exciting world of PKL. Step into the shoes of a PKL team owner and make your selections from the top performers of the day. When done with the selection process, save your team and get set for an invigorating match of Kabaddi. So, log on to Dream11 right away and test your skills and sports acumen. This is the opportunity to take your shot at the being the best team manager online.